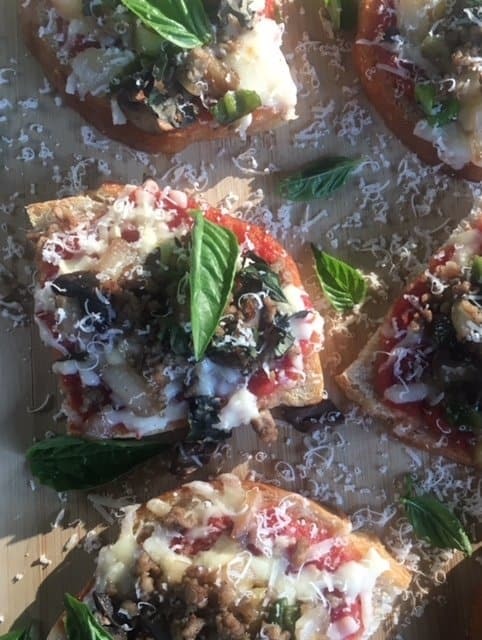 These homemade mini pizzas are made with a sourdough-bread crust, making them the perfect quick and easy dinner recipe. 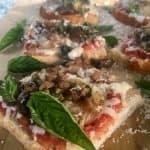 Sourdough has health benefits, and a slightly sour base is the perfect pairing with savory mini pizza toppings like sausage and veggies. No need to make your own sourdough crust: just buy a loaf of good quality sourdough bread and follow this method! These mini pizzas are quick, easy, and delicious without the bloated after-effect of most pizza nights. I’m a pizza girl. The great thing about pizza is, it’s simple to make it healthy by adding tons of veggies. And you still get all the flavor! The thing that’s always had me stumped about making homemade pizza is the crust. To me, it felt like a lose-lose situation. Either spend lots of time that I don’t have making a homemade crust (for health reasons), or purchase a pre-made quick crust that isn’t healthy. So we rarely made pizza. Last week in Arkansas, my mom introduced me to a new method of pizza-making. It was a huge success! The crust is pre-made AND healthy. How, you ask? Sourdough is unlike any other bread out there. Since it is made through a fermentation process, it’s healthier and sturdier. It also has a better flavor in my opinion. The slightly sour base pairs perfectly with savory toppings. There are several benefits to using sourdough bread instead of homemade or store-bought traditional pizza crusts. No need to bake your own sourdough loaf. Just purchase a good quality loaf at the grocery store. Done. Most breads contain a large amount of phytic acid, a substance known to inhibit enzymes which are crucial for breaking down starch and proteins. Phytic acid also binds to important minerals such as calcium, iron, and magnesium (which are necessary for health), making them unavailable to us. Reduced enzyme activity means digestive discomfort, bloating, etc. …the phytase enzymes released by the yeasts as the dough acidifies effectively pre-digests the flour, which releases the micronutrients and in turn reduces bloating and digestive discomfort. This makes our mini pizzas easier to digest, and more nutritious! Double win. The ingredient list on a loaf from ALDI is pretty basic without lots of additives, which is great. Flour, water, salt, sour starter, malted barley flour, yeast, and amylase (digestive enzyme). You can grab a loaf for less than $3, and still have some leftover for sandwiches. This makes it cheaper than store-bought crust for sure. Here’s the detailed and simple method for making these mini pizzas. Feel free to skip to the bottom of the post for the printable recipe card. First, cut sourdough bread slices in half to make them mini pizza sized. Arrange on a large baking sheet. Bake for a couple minutes at 450º F to lightly toast and help the “crust” harden a bit. Next, brush bread slices with olive oil. This creates a barrier so the pizza sauce doesn’t soak the bread and make it soggy. Sourdough is already sturdier than most breads, which is why this works as a pizza crust when most breads would not. Add your favorite natural pizza sauce. 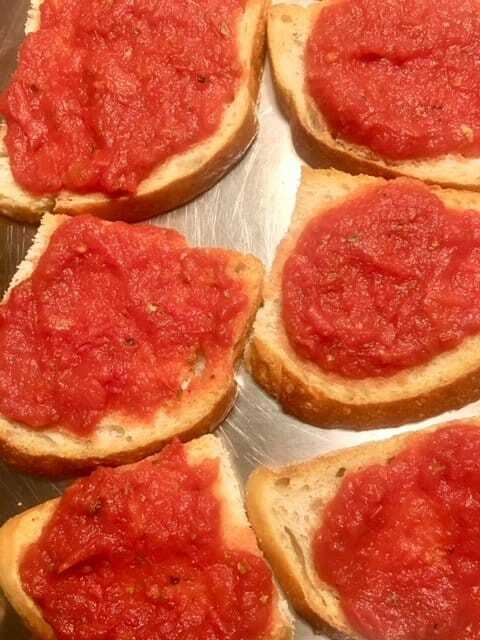 Or, make your own with plain tomato sauce mixed with Italian seasoning, a bit of salt, and a bit of organic sugar or honey (to reduce acidity). Add your favorite toppings. We love Cabot sharp cheddar, but you can always use trusty mozzarella. Sauteed veggies are great, and nitrate-free pepperoni, ground sausage or bacon is also a perfect choice for pizza. Bake at 450 ºF for approximately 10 minutes, or until cheese is melted and bread looks toasty. Add a sprinkling of fresh parmesan cheese and fresh chopped basil, if desired. Here’s the recipe card for your convenience. If you enjoy this recipe, please leave a recipe rating in the comments section! I would truly appreciate it. 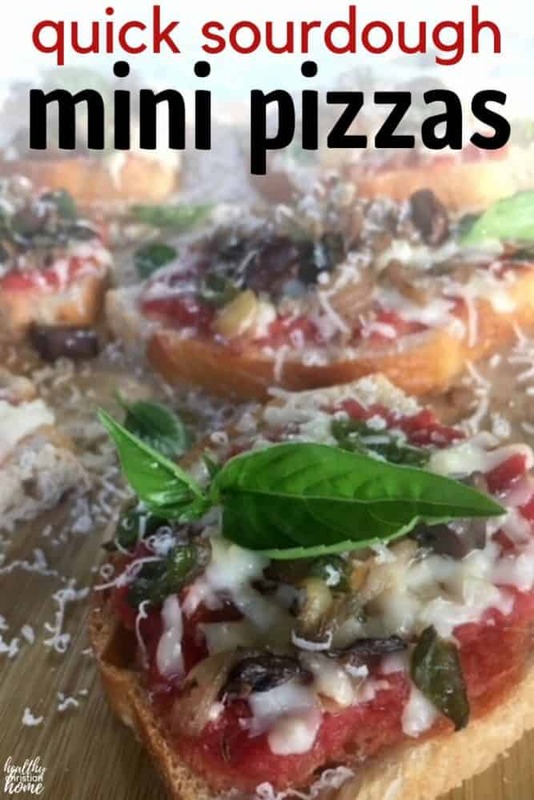 Homemade mini pizzas made simple! This easy and healthy sourdough bread "crust" pairs perfectly with savory, mouthwatering pizza toppings. 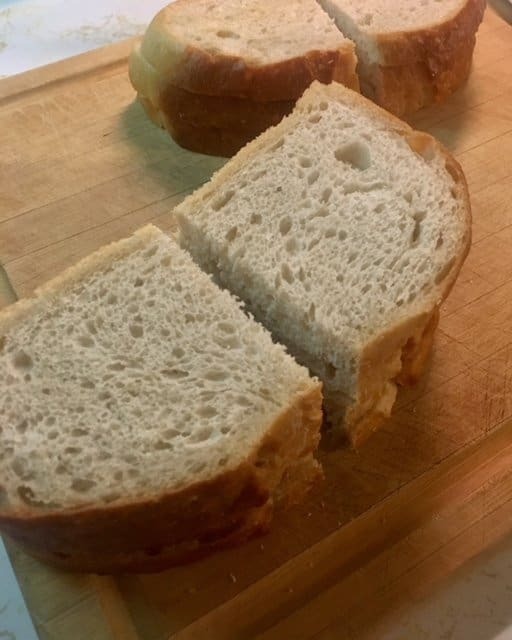 Cut sourdough bread slices in half and arrange on a baking sheet. Bake at 450 F for about 2 minutes to lightly toast. Brush with olive oil. Add pizza sauce, cheese, and desired pizza toppings. Bake at 450 F for approximately 10 minutes, or until cheese is melted and bread looks toasty. Sprinkle with parmesan cheese and fresh chopped basil, if desired. Next time I make these, I’m going to try rolling or pressing the sourdough down before toasting. I’m thinking it will reduce the spongy factor even more, thus resulting in an even less soggy crust. If you try it, please tell me the results in the comments. 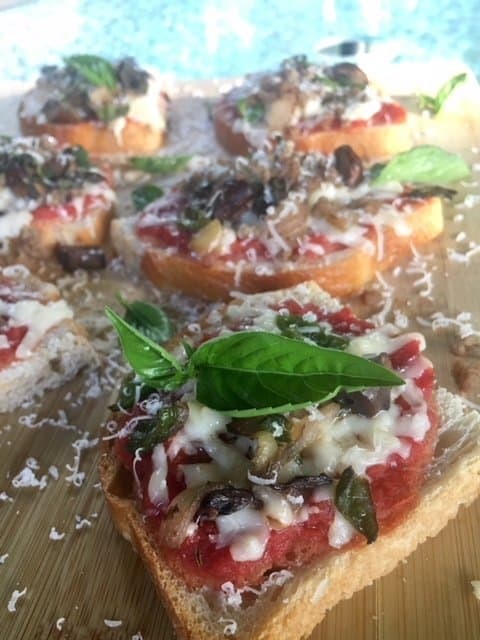 To make these mini pizzas even more healthy, sprinkle some wheat germ on the sauce before adding cheese and toppings for an extra dose of minerals. This Muir Glen Organic pizza sauce is a great quick and healthy choice for these mini pizzas. I’d like to try this nitrate-free pepperoni next time – it looks delish! Oven temperatures and baking time may vary. Just keep an eye on your pizza to make sure it doesn’t get too brown. Store leftovers in a flat dish or large ziploc bag. Stays fresh for 3 days and can be reheated in the toaster oven or regular oven at 400º F for 5 minutes or so. 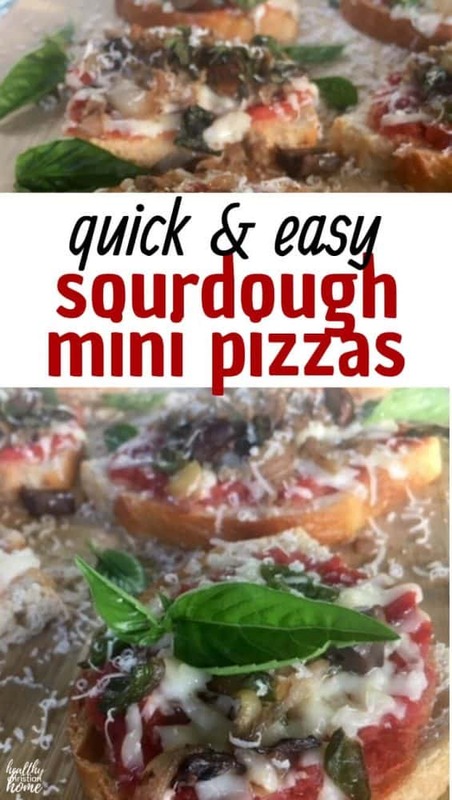 Are you a mini pizza lover like me? Share your favorite toppings in the comments! Enjoyed this recipe? PIN IT!